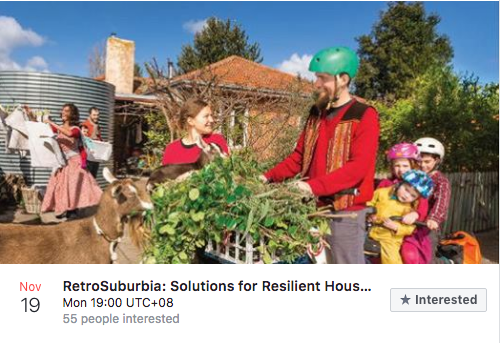 David Holmgren’s best selling book RetroSuburbia is inspiring and empowering people throughout Australia to make positive changes in their life, creating sustainable and resilient lifestyles, households and neighbourhoods. Beck Lowe worked closely with David on RetroSuburbia throughout its writing and production. She will present an introduction to the themes and ideas in this important and exiting book, as well as a short overview of how the book was developed. There will be time for questions and discussions. Come along and be inspired to create meaningful changes in your life!